Essentially it's a virtual bulletin board. 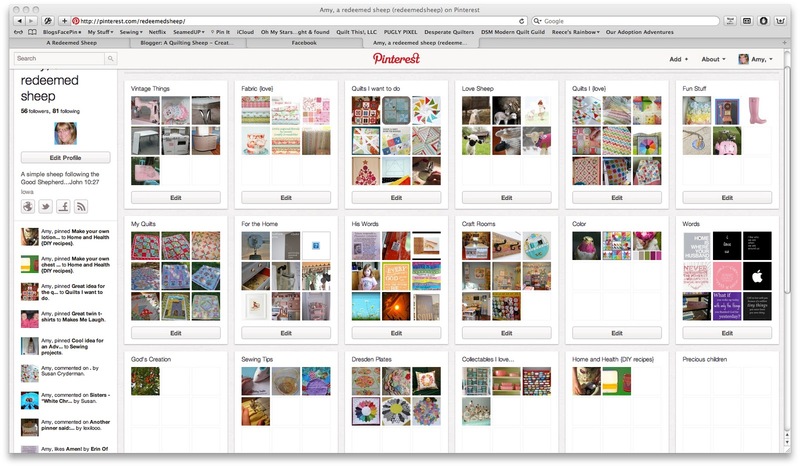 It's a great place to save bookmarks to things you want to do, for example, quilt patterns. Or you could make a pin board that holds gift ideas for your friends and family. There are a ton of household tips and money saving ideas that I really enjoy. Oh, if you like to cook and are looking for recipes, Pinterest is the place to go. Here is a screen shot of my boards so you can get an idea of what I mean. I have more boards, but they are farther down the screen. If you see something on my pin board you find interesting, you click on the picture and it will take you to the original site where the picture came from. It's a great way to save tutorials. Repinning is when you see something on someone's pin board and you want to save it to your own pin boards. And because it's on line, you don't have to remember web sites if you want to show someone something. You just go to your Pinterest account and show them from there. Here is where you can find me on Pinterest. If you have an account to Pinterest, let me know! I would love to follow your boards! Amy, I just found your blog through Happy Cottage; followed you on pinterest, and appreciate your post on it! I just joined, so I'm on the learning curve now! BTW, I'm your newest Pinterest follower! Pinterest scares me.. I think if I joined I would never exit the internet! I'd love an invite, Amy~ actually just "applied" for one yesterday!! Your board looks great-I look forward to visiting it! Oh hey Amy! I am on Pinterest too! Love that place. It's so addicting :D.....like I need that! I'm a follower of yours now:) Thanks for sharing. I have seen this and really need to figure it out. oooo would love to have this to remember everything i put on my to do list!!! great idea... how does it work.. you download a freeware?? ?